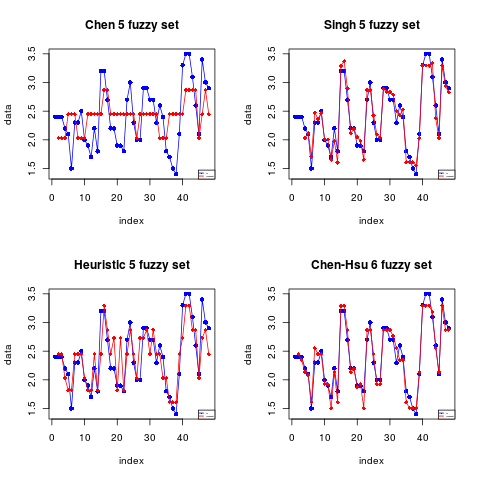 Calculates fuzziness of time series with Chen, Singh, Heuristic and Chen-Hsu. Point values use to divide fuzzy stes for Chen-Hsu model. If bin=NULL (default) then function just inform information about fuzzy sets. Let trace=TRUE to print all of calculation results out to creen. Let trace=FALSE (default) to only print fuzzy series out to creen. Let plot=TRUE to paint graph of obsevation series and fuzzy series. Let plot=FLASE (default) to do not paint graph. Information about fuzzy series of Chen, Sing, Heuristic and Chen-Hsu models (in bin!=NUL). Information about 7 accuracy of forecasting model. Chen, S.M., 1996. Forecasting enrollments based on fuzzy time series. Fuzzy Sets and Systems. 81: 311-319. Chen, S.M. and Hsu, C.C., 2004. A New method to forecast enrollments using fuzzy time series. International Journal of Applied Science and Engineering, 12: 234-244. Huarng, H., 2001. 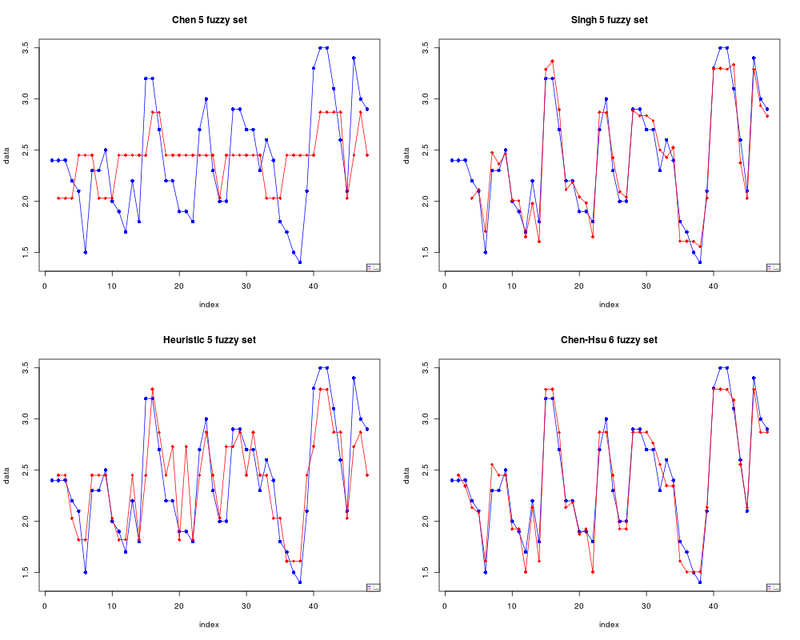 Huarng models of fuzzy time series for forecasting. Fuzzy Sets and Systems. 123: 369-386. #useing ChenHsu.bin function to find divide point fuzzy set values. > #useing ChenHsu.bin function to find divide point fuzzy set values.